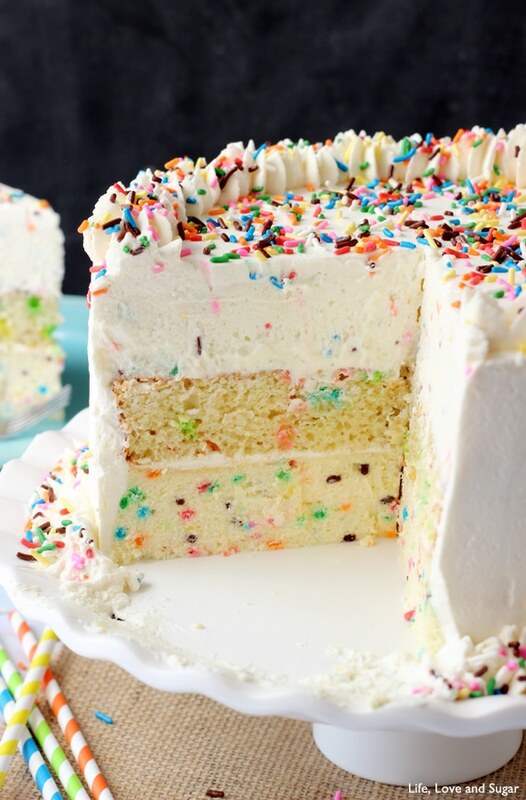 This Funfetti Millionaire Cake is funfetti overload! And TOTALLY awesome! 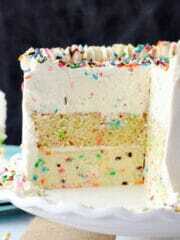 The bottom layer is a funfetti cheesecake, the middle is funfetti cake and the top layer is a funfetti mousse. 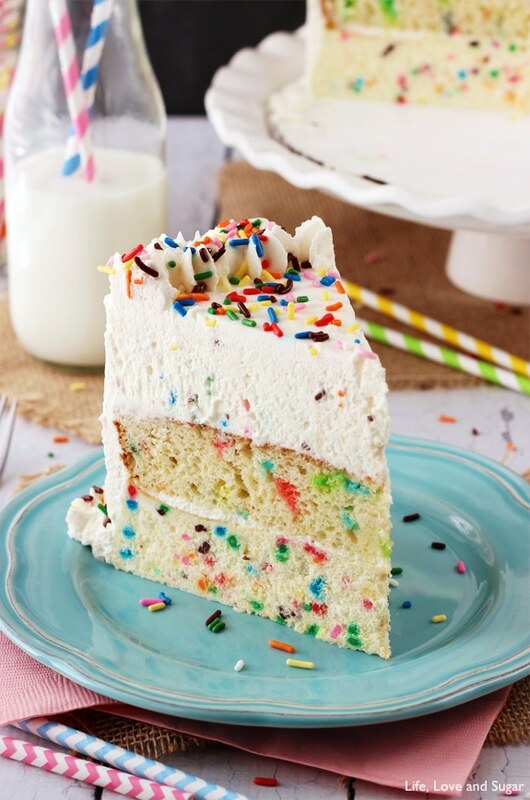 Seriously one amazing funfetti confection. I am completely in love with it! Surely you know that I am a huge funfetti fan. No? 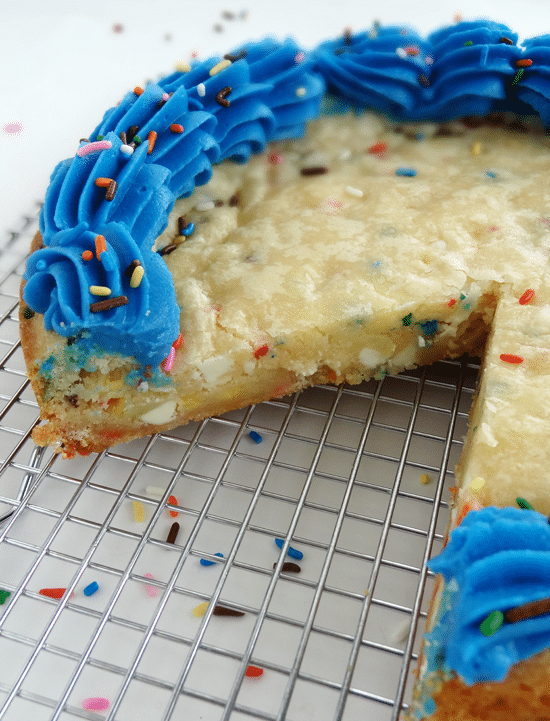 Have you seen my Funfetti White Chocolate Chip Cookie Cake? 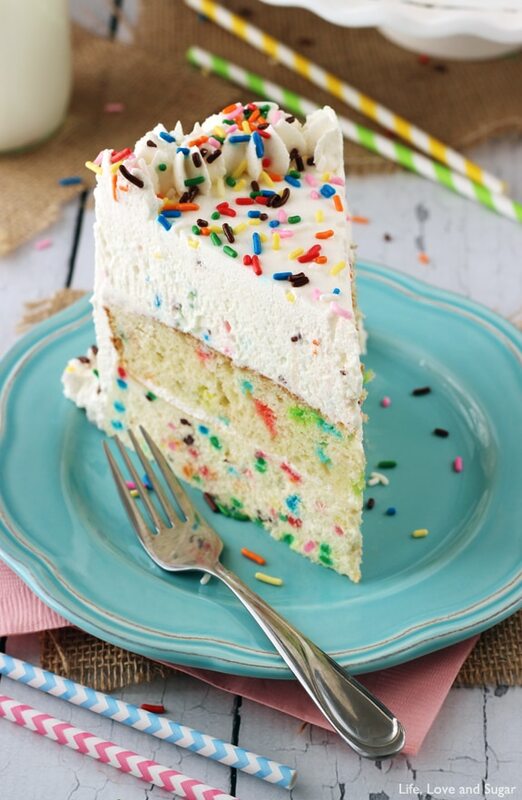 Or my Funfetti Ice Cream Cake? Or maybe my Funfetti Overnight French Toast Casserole? There’s even more funfetti than that, but we’ll start with those. 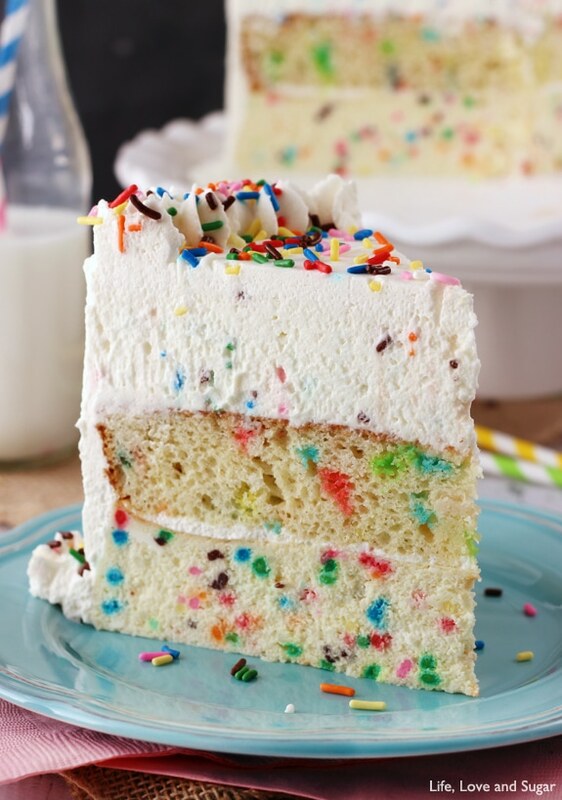 I abso-freakin-lutely love funfetti. Ever since I was a kid, it’s been my jam. If something hasn’t been funfetti-ized. I will do my best to funfetti-fy it. And not just any funfetti. The Pillsbury box mix will always be my first cake mix love. And I know I’m not alone. But, back to this cake. I actually used Pillsbury Funfetti mix as the cake for the middle layer of this cake. Since I’m a firm believer in it, I didn’t try to replace it with another. I used the original. And I even tried using it in the cheesecake, but it ended up not being quite the right texture. So instead of using box mix, I used a little trick I learned from one of my favorite bloggers, Sally, a while back. If you use a little butter and almond flavored extracts, it gives you a very nice cake mix-like taste without actually using a cake mix. Genius! So I applied that to the cheesecake and mousse layer and it was perfect! Layer 1 – cheesecake. Not all all hard or scary to make. Really. It’s a straight forward cheesecake. After so much experimenting with my Banana Pudding Cheesecake, I’ve gotten a lot more confident with changing them up. It’s fun. 🙂 And the best part about this one is if you mess if up a bit (which you won’t, but if you do), it goes into a cake where you won’t even be able to tell. Score. Layer 2 – cake. It’s made from a box mix. Unless you want to make it hard on yourself and use your favorite from-scratch mix. Still, super easy. Layer 3 – mousse. I had never actually made mousse, so I was unsure if it’d be hard to do. But it was SO easy. I went off of a recipe from Brown Eyed Baker. And ohmygosh, it is SO good. I could eat the mousse all by itself. Pass me a spoon! Seriously. It had some gelatin in it to help stabilize it, but it is not at all gelatin-y in texture. It is light, airy, smooth, perfect. Then, to top it all off, I used a whipped vanilla icing. And you guys. I have been playing with whipped creams recently (have you seen my Bailey’s Chocolate Whipped Cream? ), so with all the richness of this cake I figured I’d go lighter on the icing. This is the BEST whipped icing I have EVER had. Like ever. I could not keep my finger out of the bowl. I’d almost say forget the cake and just make the icing. Almost. And if it’s possible, it’s even easier than making buttercream. It’s truly just whipped heavy cream, vanilla and powdered sugar. I wasn’t really sure how much powdered sugar I’d need to stabilize it for a cake, so I checked out Aimee’s whipped icing. She’s been sharing some seriously awesome icings recently. Definitely check those out! There’s even more to be excited about today! As if this cake wasn’t enough! My bloggy bestie, Julianne from Beyond Frosting, and I have come together to bring you TWO super exciting things. We both recently hit 10,000 Facebook fans! Woohoo!! So we decided to pull together an awesome giveaway of some of our favorite things to bake with. Initially, it was just going to be 10 things (like 10,000 fans, you know?) but then we got a bit carried away. There were just too many funs things! So there’s a few extra – and it’s all awesome! I definitely want to say a BIG, BIG THANK YOU to all who read my little spot on the internet. And all of you who follow along – however you follow. It means SO much to me! And when you tell me how much you love the recipes and my posts, it truly brightens my day. You guys are the best! And the other exciting thing we have planned starts Monday. We’ve got 14 fabulous bloggers coming together to bring you COOKIE DOUGH WEEK next week!! Who’s as pumped as I am?!? If you aren’t pumped, you better get pumped, because I know what they have in store for you and it’s going to rock. your. world. So get ready. Ok. Sorry for the long post, but I had so much to share with you! An awesome recipe, a super fun giveaway and cookie dough week next week! My head is going to explode from all the awesome-ness! Best Ever Cupcake Icing Kit – my very favorite icing tips for cupcakes. It’s 5 Ateco icing tips. I’ve been through a couple kits myself. They really are the best ever. And they come with a massive, reusable piping bag that fits the large tips perfectly. Rock on. Rubber Spatula – It’s Betty Crocker. It’s awesome. It doesn’t have ridges down the sides, so when you wipe of excess dough, there’s none left in the crevices. That’s how I roll. Cupcake To-Go – for when you can’t leave home without a cupcake. Happens to me all.the.time. Polka Dot Cupcake Liners – because they are cute and you need them. Piping bags – always needed. Fun baking towel – says “A great many things can be resolved with kindness, even more with laughter, but there are some things that just require cake.” Truer words have never been spoken. Cookie Scoop – tos make sure your cookies are the right size. Very important for getting that perfect cookie. Offset spatula – I use this to spread pretty much everything. I never knew how awesome it was until I started using one. 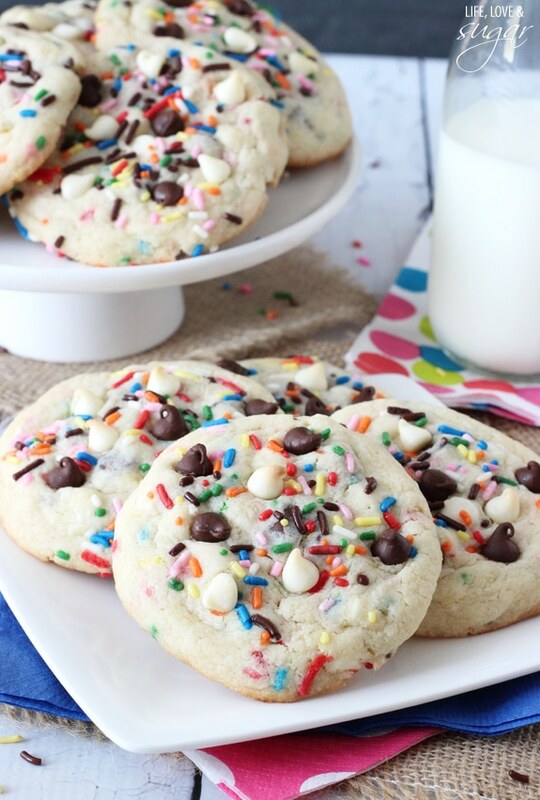 Fun sprinkles – you can never have too many. Ghirardelli Chocolate Chips – what baking kit would be complete without chocolate? Food Network Magazine – so many great recipes! Silpat baking mat – helps you bake your cookies perfectly and evenly! 1. Preheat oven to 300 degrees. Line the bottom of a 9 inch springform pan with parchment paper and grease the sides. 2. In a large bowl, blend the cream cheese, sugar and flour. Use low speed to keep less air from getting into the batter. 3. Add the sour cream and 2 eggs. Beat until just combined. 4. Add other 2 eggs, sprinkles and almond and butter extracts. Beat until combined. 5. Pour the filling into the pan. Drop onto the counter a few times to release any air bubbles. 6. Wrap bottom of pan in aluminum foil and prepare it for a water bath. 7. Place foil wrapped pan in a another pan large enough for a water bath. Fill water pan with warm water about half way up the sides of the springform pan. 9. Turn off heat and leave in oven with door closed for 20 minutes or until set. Center of cheesecake will not look fully cooked, but will continue to cook in the oven. 10. Open oven door halfway and let cool for about 10 minutes. Cheesecake will be very tall, almost over the edge of the pan, but will begin to fall as it cools. 11. Refrigerate until firm 5-6 hours. 12. Remove cheesecake from springform pan to use later. 1. Line the bottom of the same sized 9 inch springform pan used for the cheesecake with parchment paper and grease the sides. 2. Mix cake mix, oil, eggs and water together until well combined. 3. Pour into prepared pan and bake at 350 degrees for 20-25 minutes, or until a toothpick inserted comes out with a few crumbs. 4. Allow cake to cool for 5-8 minutes, then remove to cooling rack to cool completely. 5. When cool, remove cake dome from top of cake. 1. In a small bowl, sprinkle the gelatin over the water, let stand for about 5 minutes. Place mixer bowl and whisk attachment into the freezer for about 10 minutes. 3. Microwave 3/4 cup of heavy cream until it begins to boil. 5. Pour cream over the white chocolate chips and let sit for about a minute. 6. Whisk until chocolate is melted and mixture is smooth. Set aside, cooling for about 5-8 minutes. 7. Take bowl out and whisk out of freezer and whisk remaining 1 1/2 cups heavy cream at high speed until it begins to thicken. 8. Add almond and butter extracts and continue whisking on high until soft peaks form. 9. Add about a third of the whipped cream to the chocolate mixture and mix well. 10. Add remaining whipped cream and sprinkles and mix until well combined. Set aside and move on to next steps. 1. Prepare the same springform pan you used to make the cheesecake and cake. Put parchment paper on the bottom and around the edges, sticking up above the top edge of the pan. 2. 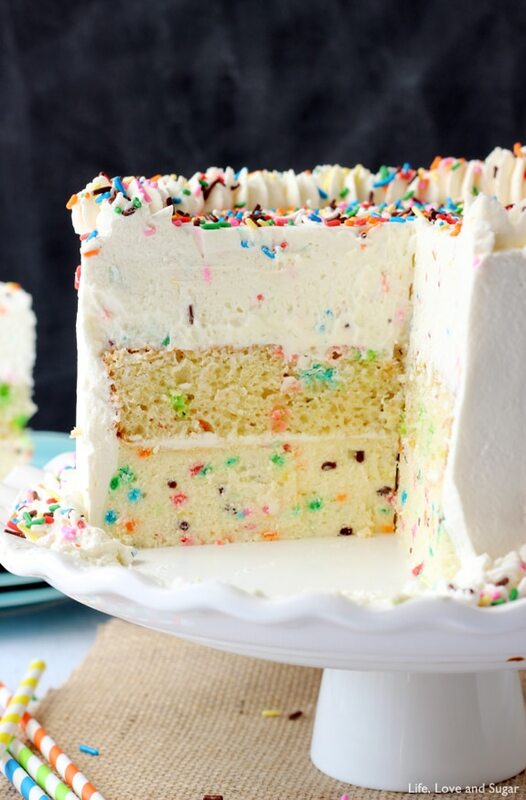 Place the funfetti cake into the cake pan. 3. Pour the funfetti mousse on top of the funfetti cake and spread evenly. 4. Refrigerate until set, about 2 1/2 hours. 1. Put mixing bowl and whisk attachment in freezer for about 10 minutes. 2. Remove bowl and whisk from freezer and whip cream on high until it begins to thicken. 3. Add vanilla extract and powdered sugar and whip on high until thick and creamy. 1. Get funfetti cheesecake out of refrigerator, as well as the funfetti cake and mousse that are already layered together. 2. 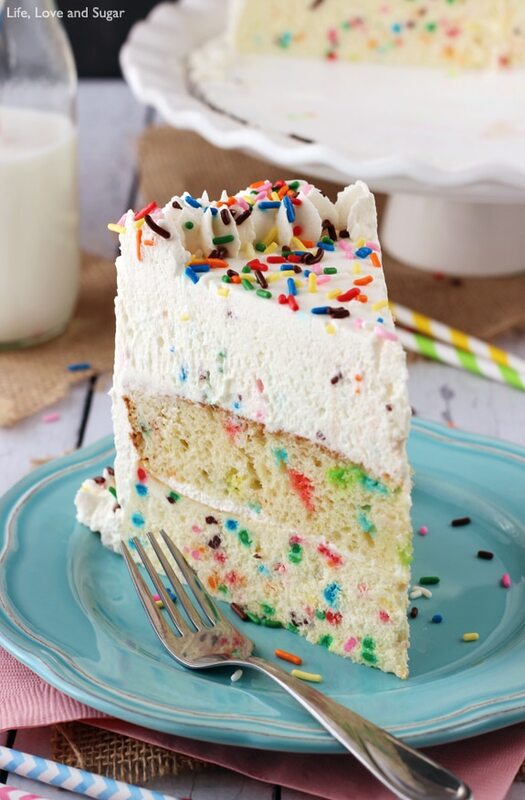 Place funfetti cheesecake on a cake board, or the plate you will service it on. 3. Remove funfetti cake and mousse layers from springform pan. 4. Spread a thin layer of icing on top of the cheesecake. 5. Place the funfetti cake and mousse layers on top of the cheesecake, using the cake to lift it. The cake should end up as the middle layer, with the cheesecake on bottom and the mousse on top. 6. Ice the cake with the remaining whipped icing. Decorate with additional sprinkles, if desired. I am LOVING this cake, especially with that cheesecake as a layer. Yummy! This is such a fun cake. I love all the layers and I can only imagine how they taste and feel altogether. Great recipe and so creative. This cake looks seriously amazing Lindsay! So much fun! Such a great giveaway too – my favorite thing to bake is COOKIES! I LOVE THIS CAKE! I do a lot of cheesecake cakes on my blog, but this version is fantastic! My favorite thing to bake is probably cookies. 😉 But I love the funfetti! This cake looks phenomenal!! I must make this for my boyfriend!!! He is a funfetti fiend! I love to bake and decorate cupcakes. This looks like the best thing ever for my sister! My son would love this cake! I love to bake cookies and bar cookies because they are easy to share. New to your site and really enjoying it. I love experimenting and baking new things often. But my favorite thing to eat that I bake is always brownies. This cake looks amazing. Its beautiful and sounds so delicious! Oh my goodness I’m so excited…about so many things (you threw a lot of stuff at us today!). 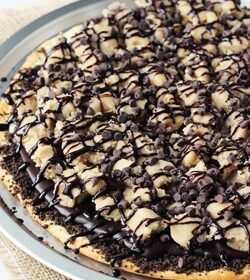 Cookie Dough week has my full attention! And YAY for your 10000 fans, I’ll be super happy when I hit 10…period!! Now I have a cake to make, excuse me. Thank you Risa! I know – it’s a lot of stuff! So glad you’re excited for cookie dough week – I can’t wait either! my favorite thing to bake: dessert of any kind! I’m not much of a cake baker… More of a cookie girl! I love making cupcakes – decorating with frosting and sprinkles is the best part! This cake looks amazing! 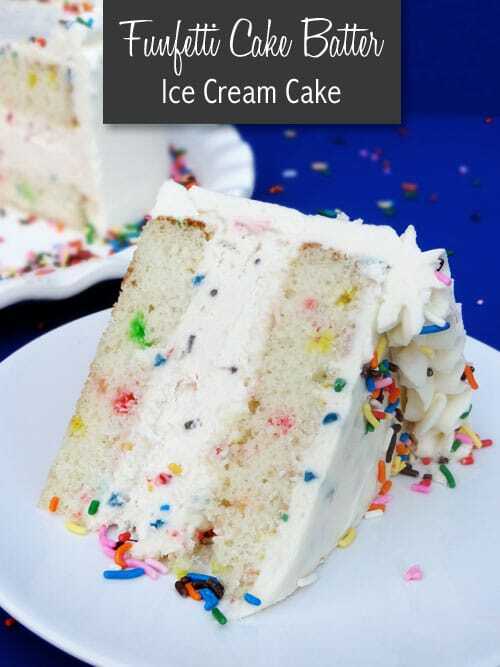 My husband would love this, he loves funfetti cake! My favorite thing to bake is cupcakes and cakes! I feel like it’s where I can be the most creative with texture and flavor combinations as well as holidays and celebrations. I love working with frosting and decorations on them too! My favorite thing to bake is cookies. This cake is beyond amazing! Gorgeous cake! I love baking cupcakes! This looks so fun and so yummy! That cake looks amazing! I’m not sure if I’m going to attempt making it, but I pinned it just in case! And that cake is just too cute. Perfect for the next birthday in my life. I love this so much!! It is gorgeous and I am sure it tastes wonderfully!! My favorite thing to bake is cookies for sure!! OMG, those cookies you made at Christmas were AH-MAZING! Wonderful giveaway! My favorite thing to bake is peanut butter cookies! I thought I would let you know that there is a little typo with @beyondfrosting on the rafflecopter. Your blog is beautiful! Thank you! And thanks for letting us know Miranda! What a FABulous idea! I’ve seen a cake-topped cheesecake, a cake-bottomed cheesecake and every such combination in between, but never this, and never in funfetti. 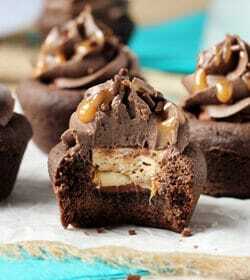 And can I just say that there aren’t enough non-chocolate mousses in the Pinterest universe? Thank you for your step in the right direction: stop chocolate mousse supremacy. Keep on being awesome! This cake looks totally amazing!!! I am very excited to attempt it. I love to bake browned butter chocolate chip cookies! Today I’m going to make some coffee cake though (another favorite). Holy $#[email protected] This is the best cake ever! Hmmm … I don’t know if I have one favorite thing to bake. I do like to make nice cakes for each of my family members for their birthdays (there are six of us, so I get a lot of practice :)). The kids usually want some kind of character or theme, and I like the challenge of trying to execute it, even if the results aren’t always perfect. Thanks for letting us know Mandi! We’ve fixed it. I’m newly addicted to baking cupcakes(and cakes)… but I made some Almond Cherry Cupcakes that were delish! I can’t wait to try this cake! Also my favorite thing to bake is cupcakes- funfetti cupcakes. I love baking cupcakes and chocolate chip cookies! My favorite things to bake are cookies, biscotti, muffins, and quick breads. I wish that I was sitting at your kitchen table having this for breakfast in this exact moment. Time machines can’t be invented quickly enough! this looks so good! my favorite thing to bake is cupcakes. I love baking, im always in the kitchen making cookies or cakes or anything sweet really. I love baking chocolate chip cookies. Mostly because they taste SOOOOOO good just a few minutes out of the oven! This cake looks so yummy!!! I love to make a decadent double chocolate chip crater cake with a ganache frosting. It is so YUMMy! 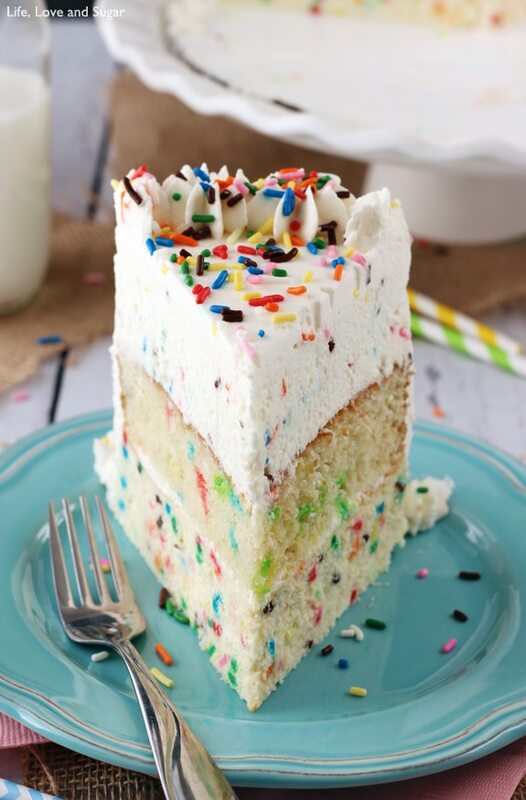 Lindsay, anything funfetti is actually my favorite to bake! What a fun giveaway… and a most fabulous recipe! I love the tip you got from Sally… that IS genius! I hear you! Funfetti ROCKS! Thanks Gloria! I love to bake cocktail cakes, it’s a hobby and obsession! 😉 Congratulations!! Cocktail cakes – how fun! Thanks Lisa! I like to bake poundcakes. Thanks for chance to win. Ohhh! I can’t wait to make this cake! I love baking bread puddings! This cake looks AMAZING!!! I love to bake anything and everything. Mainly desserts though, so I can eat them! My favorite thing to bake is probably cookies. Or cake. It’s all delicious. Wow! Awesome concoction. 1 question: when do the 4 Tbsp. sprinkles get added to the mousse? At the very end, before it gets set aside? Thanks Cheryl! That’s correct, the sprinkles are added at the end, just before setting aside. Ding dang! That was quick. Thanks! This cake rocks my socks off!! So many gorgeous delicious fantastic layers going on!! I would most definitely have trouble not eating that entire cake myself! 😉 Pinned! Oh my goodness — this is such a fun, festive idea. Sometimes I hate having to choose between cheesecake and cake You’ve made it so I don’t have to. And I love how much the cheesecake layer looks like actual birthday cake. This has to be one of the prettiest, most delightful cakes I’ve ever seen! Such a gorgeous cake! Thanks for linking up What’s Cookin’ Wednesday! Oh my goodness, this looks absolutely amazing! YUM! This is absolutely gorgeous and a MUST for our home. Funfetti is my husband’s favorite cake. Can’t wait to try this! Thank you Des! I’m a huge funfetti fan too, so he’ll love this! I love the thick frosting on this cake! I’m making tis cake and get to the cake part and its like cookie dough mixture are you supposed to put water in here like the box says? Hi Tammy! Yes, there should be 2/3 cup of water. Can you please include that in the recipe? I had the same question as Tammy did. I didn’t know whether the ingredients were wrong or if the directions were wrong. Thanks! Going to make this cake for my husbands birthday. Just curious on how long the whipped frosting lasts before it deflates? I want to know how early I can make the cake or if its best to do it all last minute. The whipped frosting has quite a bit of powdered sugar in it, so it shouldn’t deflate as long as you store the cake in the fridge. I had it in the fridge for a number of days and it was fine. I even froze some of it and defrosted later and didn’t have any issues with the whipped icing deflating. 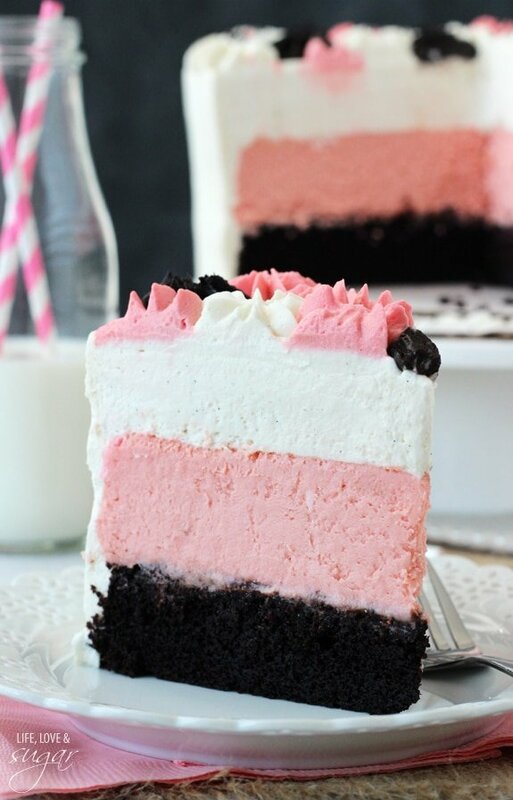 I’m making this for friends and turning it into a gender-reveal cake by dying the funfetti layer either pink or blue! I’m excited, but I did a practice run this weekend just to make sure I figured out any hiccups. The cake and cheesecake layers turned out fine, but I messed up my mousse. I used almond bark instead of white chocolate chips, which I read was an ok substitute, but I think I overbeat the cream because the mousse turned out chunky and separated. I added two more packages (about 4-6 tsp) or gelatin to it, as well as some funfetti cake mix that was leftover, and it thickened, but it was still chunky (obviously too late to fix that). Do you have any suggestions on how to have success with the mousse for round 2, or could you point me to a foolproof, easy mousse recipe? Hi Jenny, what a fun gender reveal cake – love it! As for the mousse, I’d think almond bark would be ok, but have never used it in a mousse before. You could try white chocolate chips to be safe. It’s hard to diagnose from afar. I’m wondering though – was the mixture chunky before you added the whipped cream? Or only after adding the whipped cream? Sometimes gelatin can be a little chunky if it doesn’t totally incorporate. When you add the gelatin to the cream, just make sure that it gets smoothly incorporated before being added to the white chocolate. You could heat the gelatin for a few seconds before adding to the cream if you want just to make sure it heats and smooths out. I hope that helps! My traditional bday cake as a kid was always funfetti (with peppermint ice cream as I am a just-post-Christmas baby) – so next December, this will be the new tradition even if I have to make it myself! How fun – I’m a Christmas baby. 🙂 This cake would be perfect for a birthday! What do you suggest I do with the extra cake mix left over? Could I use your funfetti cookie recipe and just add the cake mix I have left plus flour to make up the difference? Thanks for your help. I’m excited to finish the mousse soon and taste it tomorrow at a shower!! The cookies might be tough – you’d need to add some sugar and other ingredients along with the flour for it to turn out the same. Here are some rice krispie treats and pancakes though that use a smaller amount of cake mix. Was just surfing the internet, and then the banner displayed….my expression was like whoooooo yummy.!!!!! one of my favorite. Seriously, Lindsay thanks for the recipe. 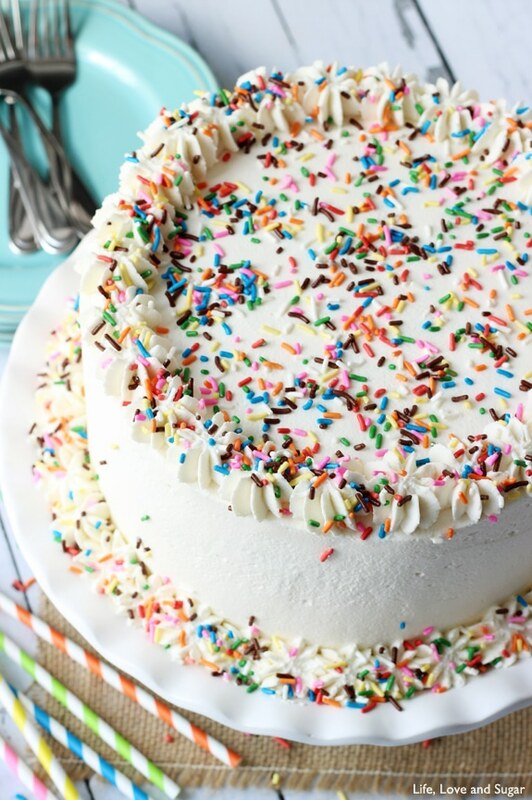 This Funfetti Millionaire Cake is one of my favorite cake as mentioned, the bottom layer – funfetti cheesecake, the middle – funfetti cake and the top layer – funfetti mousse, seriously confection. This looks so incredible! It has everything you want in a dessert. So many layers and flavors, wow, I am impressed! Just beautiful! This is my 3rd year making it for my daughter’s birthday. She’s a funfetti freak like you and she’s 28. It is one scrumptious cake! Everybody loves it. Did I do something wrong if my cheesecake wasn’t tall like you describe but is definitely set? It’s hard for me to say without seeing it. If it’s set and the texture is fine, it should be alright. Hi Lindsay, I’m making this for my best friend’s birthday, and I’m doing it in chunks. Can I frost the cake the night before, or will it deflate? Yes, you can frost it the night before. Just be sure to use the full amount of powdered sugar called for. That is what stabilizes the whipped cream frosting. Very disappointing. Overly sweet and the world’s most sense cheesecake. Never had a cheesecake so heavy before. I have made many and they are always light and fluffy. Extremely bland cake overall. Was so excited to make this and it was disappointment at first bite. Glad I didn’t present this to other people and just made it for my family. ** Please no bashing. Everyone has their own opinion. 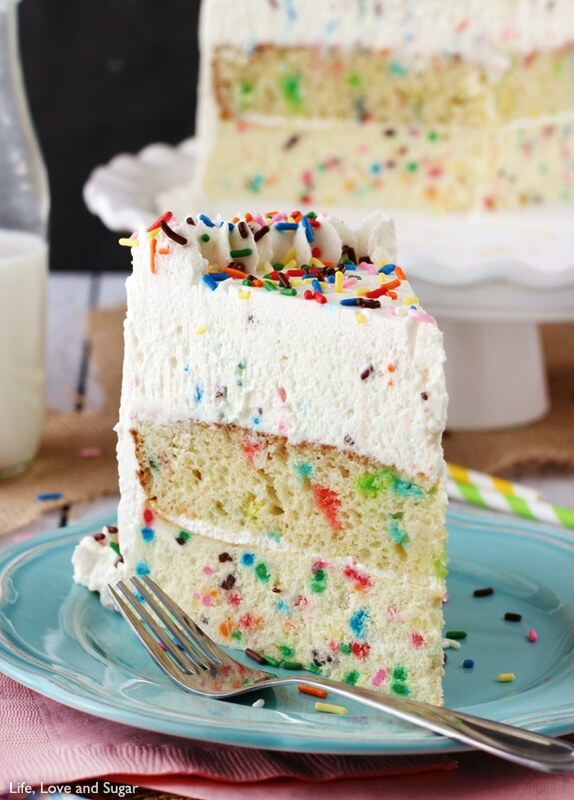 Would your no-bake Funfetti cheesecake be an acceptable substitute for the cheesecake layer? I haven’t tried either of the two recipes–i’m new to your blog (love!) and was just skimming through. Time savers are definitely my friend! I’m thinking it would be fine, just curious if you had tried it. I’m not sure that’d work very well. A baked cheesecake will hold up to the weight of the other layers on top, but I don’t think the no bake one would. Love this cake, I would be totally happy stuffing my face with a big slice of this pumpkin cake – it looks beautiful! I love love love this idea and have been looking around for others like it (cheesecake + cake + mousse). I have only found 1 other flavor combination on pinterest. Have you tried with other flavor combinations or a fruity version? Beautiful cake! Hello and THANK YOU for this fantastic recipe, made it for my daughter’s Golden Birthday yesterday (31 on the 31st) and it was delicious. What a perfect and special cake! I had never made mousse before so I stumbled twice and had to remake it, but it was purely my doing as the recipe is precise, well written and organized. Once I followed the steps for the mousse exactly, it worked and now I feel I understand the process. Thank you again for sharing this recipe. I also made a funfetti wedding cake for a friend once! I think your millionaire cakes look completely indulgent, can’t wait to make one. This may seem like a silly question, but how do you remove the cheesecake from the springform pan cleanly especially without a crust? I only have one 9″ springform pan. Also, any tips to successfully remove the layered funfetti cake and mousse from the springform pan when assembling the final cake? I’m afraid of ruining any of the layers at this step! The cheesecake should be baked in aluminum foil. Once it’s baked and completely cool, it should be firm enough to carefully hold onto while you peel off the foil. I made this cake for my birthday and it tasted amazing! Such a fun idea with the different textures. I only gave it 4/5 stars though because the instructions for the mousse layer are a bit vague. My first attempt at the mousse using the directions here was a miserable fail. But I did some research and tried again …waiting longer for the choc mixture to drop in temp and folding in the whipped cream in 3 batches. Also, the almond extract flavor was somewhat overpowering in the cheesecake layer so I think I’ll add vanilla extract next time. All around fun idea and I can’t wait to make more of your cakes in the future! If I wanted to do like a 10″ cake, how should I change the ingredients? How many days in advance can I make the cheesecake and cake? The birthday is on a Friday, but I am busy all day Friday, and I only have one Springform pan in each size. Could I bake the cheesecake on Wednesday, cake/make the mousse on Thursday, and frost on Friday or something? If so, how should I store the cheesecake/the whole cake? Can I just drape some plastic wrap/aluminum foil over it? This cake should easily serve 14 people, depending on how big of a slice you cut. I haven’t made this cake in a 10 inch size pan before. It’s going to be a thinner cake and you would want to reduce baking time. Yes, you would be able to make this cake in phases like that. I think cheesecake does better made ahead, so you could make a couple days in advanced. My preference with cake is usually one day ahead. The cake should be stored in an air tight container in the fridge. I hope you enjoy!